Lifemask was written by Harper during a period where a congenital blood disorder threatened his health. With thoughts of life and death upon his mind, side two of the album features a lengthy track entitled "The Lord's Prayer" which Harper described as "...my last will and testament". 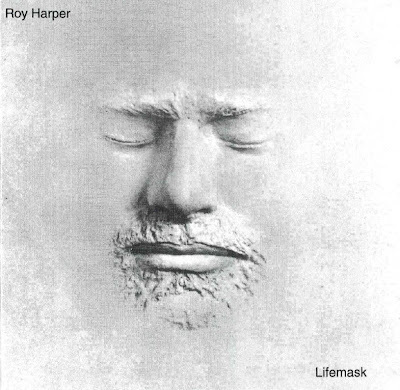 The album cover itself is a representation of Harpers 'death mask'. Some of the songs comprised the soundtrack for the movie Made which was on general release at the time. It co-starred with Carol White. The John Mackenzie directed film, Made, was the story of the relationship between a young single mother and an insecure rock star, 'Mike Preston' played by Harper. The film featured excerpts from "The Lord's Prayer", a live excerpt from "Highway Blues", a live session of "Little Lady" and "Bank Of The Dead" (a.k.a. "The Social Casualty" and "Valerie's Song") sung with alternate lyrics. oe: look like advanced Hammill voice or i'm no right? b) "Modal Song Parts I to IV"
Jimmy Page – guitar on "Bank Of The Dead" and "The Lord's Prayer"
Laurie Allen – drums on "Highway Blues"
Steve Broughton – bongos on "The Lord's Prayer"
Tony Carr – bongos on "The Lord's Prayer" and drums on "Bank Of The Dead"
Brian Davison – drums on "The Lord's Prayer"
Brian Hodges – bass on "Bank Of The Dead" and "The Lord's Prayer"
Ray Warleigh – flute on "The Lord's Prayer"